Whether you have a question about our premium line of EcoPlus remanufactured toner and inket cartridges, need assistance in purchasing or questions about becoming an authorized distributor, we want to know what's on your mind. We aim to have 100% customer satisfaction so your message is important to us! Do you have what it takes to be Green? EcoPlus is working hard to be the leader in protecting our planet by transforming recyclable materials into quality products and giving back to the community through charity and service. If you are interested in changing the world, send us your questions or choose from the following options below. 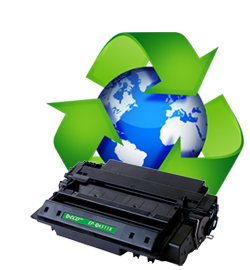 I want to know where I can buy EcoPlus brand cartridges? If you are an end-user and would like to buy EcoPlus cartridges, please complete our Find a Retailer form and a member of our EcoPlus staff will respond to you shortly. I want to become an authorized EcoPlus distributor? If you are interested in carrying the EcoPlus brand and would like to be an authorized distributor, please complete our Become a Reseller form and a member of our EcoPlus staff will respond to you shortly.